Eons before the Green Lantern Corps, the Guardians of the Universe created an android race of interstellar police—the Manhunters. When corrupted programming made them punish all life, the Manhunters were exiled. Now they’ve returned, seeking vengeance. You are Hal Jordan, the first human Green Lantern, armed with a power ring charged by your will. 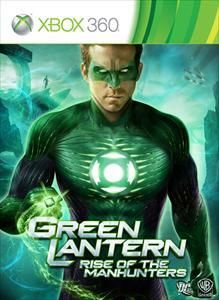 Green Lantern: Rise of the Manhunters features the likeness and voice talent of Ryan Reynolds. Support the most powerful corps in the universe and outfit your avatar with this Green Lantern emblem t-shirt. Based on the video game, Green Lantern: Rise of the Manhunters, take the power of the ring everywhere with this Green Lantern Power Batter avatar item! Based on the video game, Green Lantern: Rise of the Manhunters, suit up your avatar with this costume and look just like one of the original interstellar police force, the Manhunters! Based on the video game, Green Lantern: Rise of the Manhunters, protect your identity with this avatar item, Hal Jordan's Green Lantern mask! Based on the video game, Green Lantern: Rise of the Manhunters, suit up your avatar with this costume and look just like Green Lantern, Hal Jordan!